In this section, we will setup a subset of Quick, Draw!1. Our goal is to make a drawing classifier for squares and triangles. 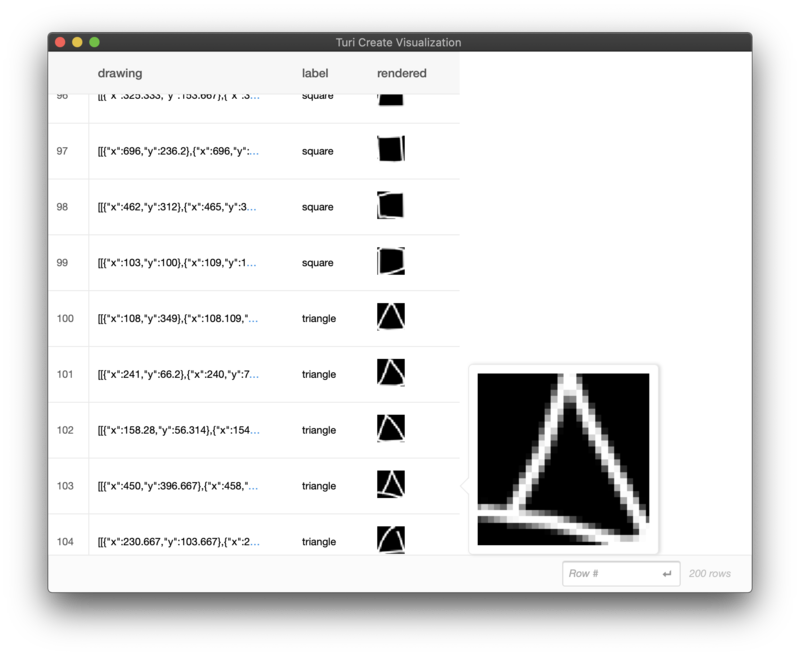 We start by dowloading a few examples of "square" and "triangle" shapes -- around 120,000 examples each, both as bitmaps and as stroke-based drawings. The following script (run from your terminal) should get you started. For both bitmap and stroke-based drawing input formats, we will sample 100 examples from each of the classes and turn it into an SFrame. When stroke-based drawing data is given as input to the Drawing Classifier Toolkit either at train or inference time, the toolkit converts the stroke-based drawings into bitmaps as part of preprocessing so the Neural Network can consume them. See How it works! for more information about the preprocessing done under the hood.